Plenty of hospitals and medical providers claim they do a great job at caring for patients and protecting their safety during care. But very few actually publish the cold, hard numbers that could prove those claims. And even fewer do it like the University of Michigan Health System has: on a website open to anyone, with dozens of charts and graphs showing actual performance and comparisons to national averages and benchmarks. Now, UMHS has added even more data to that site, which is located at www.UofMHealth.org/quality and was launched earlier this year. The update gives patients, parents, insurers, referring physicians and others full access to a full range of unbiased and up-to-date information. The site now covers conditions ranging from diabetes and heart attacks to children’s trauma and organ transplants, and shows how well UMHS provides care in settings ranging from outpatient clinics to intensive care units. It also shows how UMHS patients rate the care they receive, and how well UMHS is doing toward its goal of becoming the safest health system in the United States. 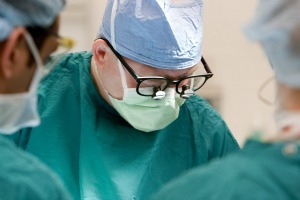 “We’re committed to sharing this information so everyone both within and outside the health system can assess our performance and, where we are not performing as expected, see what we’re doing to improve,” says Darrell Campbell, Jr., M.D., chief medical officer of UMHS and the Henry King Ransom Professor of Surgery. Campbell is responsible for the overall quality of care delivered at UMHS, and has a special interest in patient safety. Heart attack patients treated at UMHS got emergency angioplasty far faster than the national goal of 90 minutes, and had a better survival rate than the national average. Heart bypass surgery patients and patients having surgery on their aorta (the largest blood vessel in the body, leading from the heart) at U-M had better survival than others nationwide. For patients with diabetes, UMHS care is in or near the top 10 percent nationwide on care that can prevent complications or detect them early. Patient ratings of UMHS inpatient, outpatient and emergency department care continue to rise. For instance, patients who had outpatient surgery at UMHS rated their care at an average of 97.5 out of 100, and 94.6 percent of patients treated at a U-M outpatient location said they would recommend it to their family and friends. Radiation doses to patients who get a chest or abdominal CT scan at UMHS are far lower than national averages, and medical imaging is used neither too much nor too little. Critically ill adults treated in a U-M intensive care unit are less likely to die than would be expected given the severity of their condition, and less likely than national average to develop dangerous bloodstream infections. Also on the site are also stories of improvements that UMHS teams have made in order to achieve better performance on many measures, a list of the quality partnerships that UMHS is participating in or leading, and a link to a list of the many award and honors UMHS has received. The team behind the site – composed of members from UMHS Clinical Information & Decision Support Services, Public Relations & Marketing Communications, Quality Improvement and the Administrative Fellowship program – will continue to plan to add new and updated data to the site this spring. Visit the UMHS Quality and Safety site now at www.UofMHealth.org/quality .